Good evening everyone and welcome. Today I’m sharing with you a book, who’s protagonist has really stuck out in my mind since I finished the book, back in 2015. She is beyond sharp and her confidence is addicting. 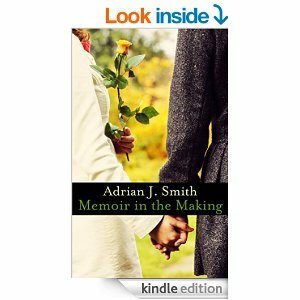 The author is Adrian J. Smith and her book is ‘Memoir in the Making’. During 2016, Adrian has published three more books, ‘Deathscape’, ‘Lost & Forsaken’, and ‘Oblique.’ Also she has been active on her blog, which you can check out. Recently I had a conversation with her. She is soon to be starting her next project. She is a proud mother of four and is very dedicated. Good morning Everyone. This is my first post to WordPress. I am publishing my latest book review from author Adrian J. Smith, “Memoir in the Making.” This book is one of a kind and one that I enjoyed very much. Read on! Ainsley is bold, assertive and usually knows exactly how to accomplish her goals. However, she suddenly realizes that something quite new – is drawing her into uncharted territory. Quickly, a raging passion arises within her as she yearns to reach out for this new found desire…love! Inside, Meredith’s heart is broken and hardened by years of pain due to a horrendous breakup. Her temperament comes off as standoffish toward some, yet, toward most, she boasts confidence. A very interesting secret of Meredith’s is disclosed and leads to surprising circumstances. “Memoir In The Making” is touching and the characters are dynamic. This story is not a simple “woman-meets-woman hook-up” formula. It’s a refreshing read with impressive depth, with just enough sizzle to make it exciting. Interactions with other people, and descriptions of scenes, etc. – truly contribute to this well rounded story. While reading, you will experience an array of emotions. For example, I felt anger at a particular point – then passion and intrigue at other times. I had to remind myself that this was fiction. I found myself obsessed, thinking about the characters even while I wasn’t reading. Author, Adrian J. Smith – creates the points of view clearly, making the dialog, etc. flow easily and sets the pace to an unrushed, completely thought out plot. To find out more, go get the book. Thanks to Ena Amanda for inviting me to this tour – and for introducing the wonderful Author, Adrian J. Smith to me – and to you. Here is another exciting excerpt from “Memoir in the Making”. “It certainly is,” Meredith muttered. Ainsley grabbed her jacket from the hook and swung it over her shoulders and arms. She buttoned it up and was just about to tie it, but Meredith stuck her hand out and stopped her. Instead of saying something or letting go like she intended, Meredith kept her fingers on Ainsley’s. She rubbed her thumb against the back of Ainsley’s hand, reveling in how soft her skin was. Everything slowed down. Meredith felt her chest rise and fall with each breath and heard Ainsley’s in response. Her heart thrummed along in her chest, and she licked her lips as they were dry. Meredith finally raised her gaze and looked at Ainsley, a blush on Ainsley’s cheeks. Stepping in closer, Meredith wrapped her arm around Ainsley’s waist and brought their bodies together. All thoughts left her as she focused only on the feel of Ainsley’s mouth against hers. She was so soft Meredith was afraid of breaking her. Ainsley shuffled forward, forcing Meredith to take a step back. She didn’t know where they were going, and she didn’t care. Thank you for stopping by. Feel free to subscribe or leave a comment, or share.